Fish tacos are a great way to work more fish into the family’s dinner menu and satisfy the most finicky eaters. Once you get a taste of them, you’ll be “hooked”! Grilling the fish on your Weber is a healthier alternative to the authentic fried fish taco. 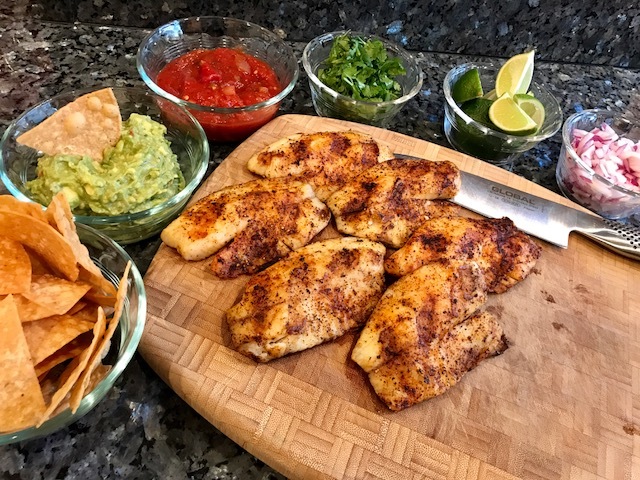 My go-to fish for tacos is tilapia. It is relativity inexpensive, readily available year round, and can be easily found at your favorite local market. 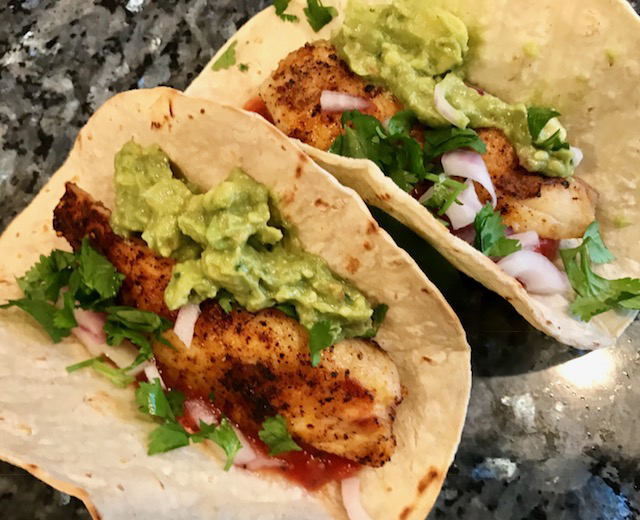 Halibut, mahi-mahi, sea bass, grouper, and even shrimp are also excellent choices for tacos. What I love most about fish tacos is the ease of preparation, and the versatility; almost anything goes in tacos. My favorite recipe is Jamie Purviance's recipe for Baja Fish Wraps with Chipotle-Lime Slaw. It's a family favorite! 1. In a small bowl mix the rub ingredients. Lightly brush the fillets with oil and then apply the rub evenly. Cover and set aside in the refrigerator. 2. In a large bowl combine the slaw ingredients and toss to coat. Set aside until ready to assemble the wraps. 4. Brush the cooking grates clean. Grill the fillets over direct high heat, with the lid closed as much as possible, until you can lift them with a spatula off the cooking grate without sticking, about 4 minutes. Turn the fillets over and cook them until they are opaque in the center, 2 to 3 minutes. Transfer to a plate. Warm the tortillas over direct high heat for 30 seconds to 1 minute, turning once. 5. To assemble the wraps, break a fillet into large chunks and arrange on one half of a warm tortilla, then top with some of the slaw. Roll the tortilla to enclose the fillings, fold in the sides, and continue rolling to the end. Cut the wrap in half. Serve warm or at room temperature. Toppings for fish tacos may include: shredded red cabbage, guacamole, jalapenos, sour cream, pico de gallo, and different types of salsa. You get the picture; so many choices in flavors and textures which will perfectly compliment the fish. You can make all your toppings in advance, grill the fish, and warm the tortillas and you’re good to go!! Let’s change up taco Tuesday, with fish tacos!! You’ll love them! ©2009 Weber-Stephen Products Co. Recipe from Weber's Way to Grill™ by Jamie Purviance. Used with permission.